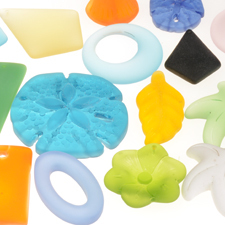 We're incredibly excited to offer you a huge selection of recycled sea glass beads for sale. 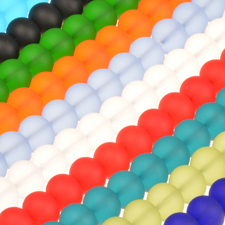 We have over 60 different styles of beads and pendants in over 36 amazing colors, so you can find the perfect style and color beads for each of your next jewelry making projects. Our cultured sea glass beads have a smooth matte finish: they are designed to simulate the polish that would naturally be created by time, sand and the sea. 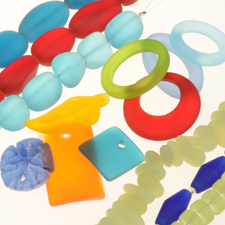 Whether you're starting on a new necklace for yourself or a birthday bracelet for a loved one, we know you'll love working with our sea glass and incorporating the beads into your upcoming designs. They look gorgeous both on their own and mixed beautifully with other bead styles and components. 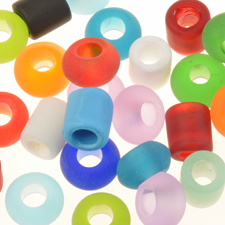 Browse our new beads now or take a look at our complete selection and shop by bead shape, color or type today. Remember: when your order totals $50 or more, we'll cover the shipping!